We have been really getting to grips with some new repertoire over the last few weeks, and it’s all shaping up to a very pleasing and varied programme of music for our ‘Magna Melodia’ concert of music from the time of the Magna Carta. One tune that we’ve been working on in particular is the lament on the death of Richard the Lionheart, by the troubadour Gaucelm Faidit. This lament is usually known as ‘Fortz chausa es’, which is its original Occitan title, but the song with its music survives in four manuscripts (and many more with just the words), and we have chosen to do one of the lesser-known versions, in which the song has been reworded in French (or more like heavily Frenchified Occitan). We went for this version for a couple of reasons – firstly, it is the one in our beloved ‘Chansonnier du Roi’, the mid-thirteenth century collection that is the basis for our 2012 CD Music for a Medieval Prince. It’s always nice to expand our repertoire from this wonderful source. Secondly, this much less well-known version of the tune is a bit different (though clearly ‘the same’ in a broad sense) and this allowed scope for us to develop our own version of the song. Thirdly, we liked the idea of a French version, as we thought it more likely for an aristocratic English audience, whose own language would have been (broadly) that of northern France. 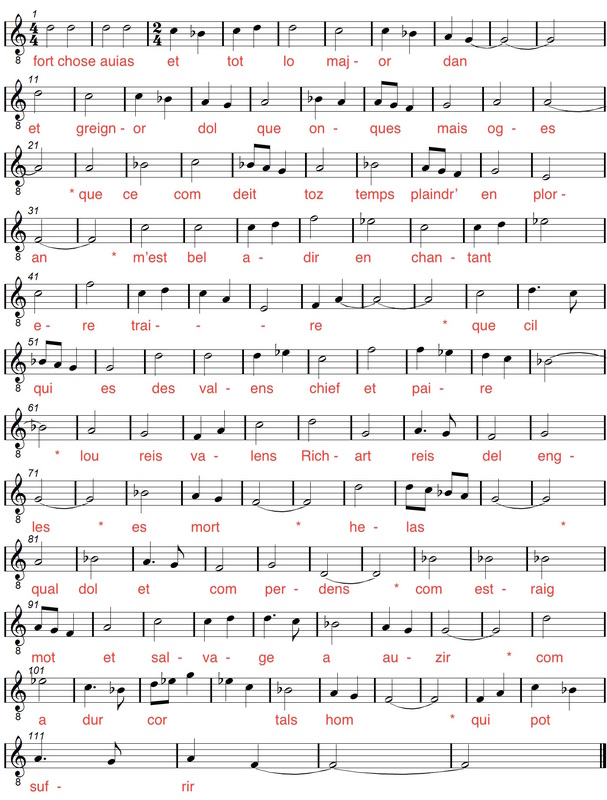 Use of the Chansonnier version, however, brought its own problems. Firstly, there are only two verses given (other versions are much longer), so we will only work with these two. Secondly, there are the usual problems of damage in the Chansonnier, and very small sections of both music and words are missing. We have substituted these sections from other extant versions. It’s a harsh matter and certainly the most harmful, and the most grievous sorrow that ever was. This thing that should be mourned for all time with weeping, I must say it well in singing and must recount it. He who was of valiant men the captain and the father, the valiant king Richard, king of the English, he is dead – alas – what sorrow and what loss – what an unfriendly word and savage to hear. The man that can endure it has a hard heart indeed. In the second verse, the poet goes on to compare Richard – favourably, of course – with Alexander the Great, Charlemagne and Arthur. In other versions, further verses lament the fate of the Holy Land now that Richard is no longer around to fight for it. I have been learning the song, and I found it a little hard at first to get a handle on it, but the more you sing it the more interesting and satisfying it gets. The melody is really unusual and in this version ends off the tonic – curious but beguiling! I am looking forward to singing it in concert, when it will be accompanied by the medieval lute. While ‘Chose fort avias’ has been our major focus over the last week, we have also begun work on a wonderful piece of Aquitanian polyphony, the ‘Lux refulget’. This has some incredibly mobile melodic lines for us to master! Paul has begun work on Bernart de Ventadorn’s “La dousa votz’, and I have been working hard on ‘Man mei longe him lives wene’ and ‘Foweles in the Frith’: the latter sounds very sweet with both lines played on the harp. We will post up some sounds on Facebook soon! Magna Melodia is our concert programme for 2015, in honour of the 800th anniversary of the Magna Carta. The initial agreement of the Great Charter lies smack in the middle of the period of music that we are most interested in, and so this noteworthy anniversary has provided an admirable spur to us to gather a good range of material into a great programme. 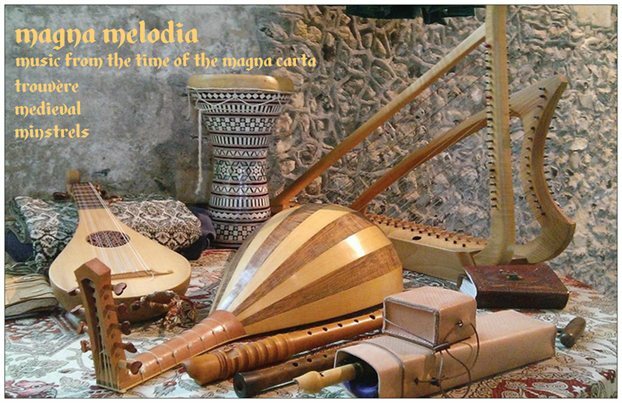 Magna Melodia is available for concert bookings in 2015 (with several already signed up! ), and also as a programme of linked presentations at medieval festivals or other medieval events. And we are going to put it all together into a CD as well – which will also be available as a digital download. Magna Melodia presents music from the world of the early Plantagenet kings – Henry II, his sons Richard and John, and his grandson Henry III. As you can see, the timespan is thus c1150 – c.1250. Geographically, the programme goes from England (of course!) to Sicily via the trouveres of northern France and the troubadours of the south. We have been able to include a great deal of our existing repertoire but have also moved into new pastures and new repertoire. Magna Melodia is at this time still to some extent a work in progress – we are trying out different options and thinking what will match up best to make the most satisfying programme – but here’s an idea of what we have in mind. 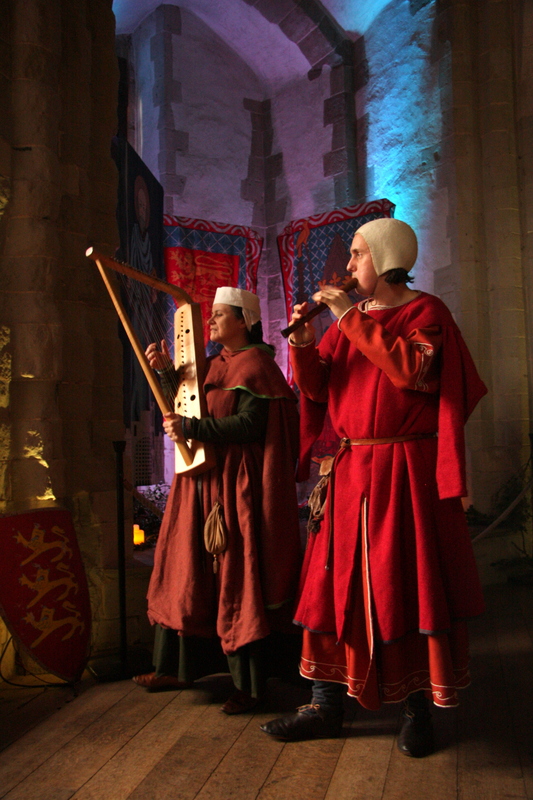 Troubadour music is also represented by a pair of songs by Bernart de Ventadorn, closely associated with Eleanor of Aquitaine: at present we are intending to pair ‘Can vei la lauzeta’ and ‘La dousa votz’. We may also include one or more tunes by Marcabru. Staying in Aquitaine, we have been investigating the rich repertoire of religious polyphony from the region. We are working on ‘Lux refulget’, an example of the new style of florid organum where the melody is at times maintained in slow held notes in the tenor and decorated by fluid and lively melismas in the upper voice. We are using Paris ms. lat. 3719, one of the manuscripts closely associated with the abbey of St Martial in the Limoges. We are really pleased to be including some Sicilian material. The Norman kingdom of Sicily was associated with the Angevins through the marriage of Henry and Eleanor’s daughter Joanna to King William II. Joanna spent her earliest years at the abbey of Fontevraud with her brother John, her near contemporary. King William died unexpectedly and young, and Joanna was taken prisoner by the new king Tancred, who had seized the throne in default of any clear male heir. She was rescued from this ignominious state by the arrival of her elder brother Richard, now king of England, and went on to accompany him on his crusade to the Holy Land. The fabulously rich kingdom of Sicily was a vibrant mixture of traditions – Norman, Byzantine, Saracen, and three books of music from the Norman Sicilian church are extant in the Biblioteca Nacional in Madrid; they contain much liturgical music and also more informal songs of praise and celebration. We include several of these in Magna Melodia. For all the cultural diversity of Sicily, this church music can be shown to derive clearly from the practices of the church back in Normandy and northern France. Indeed, some pieces, like Orientis Partibus, are also known from later northern French sources. Other trouvère material to be featured may include instrumental versions of anonymous pastourelles. Staying in northern France we intend also to include a selection of melodies from the Ludus Danielis, the play of Daniel originating at Beauvais in – it is thought – the late twelfth century. Which leaves us finally, and necessarily, in England. We aim to include here too both music of the church and secular music. For the former, we have been working on the polyphonic Verbum patris humanatur, a lively new year celebratory song. 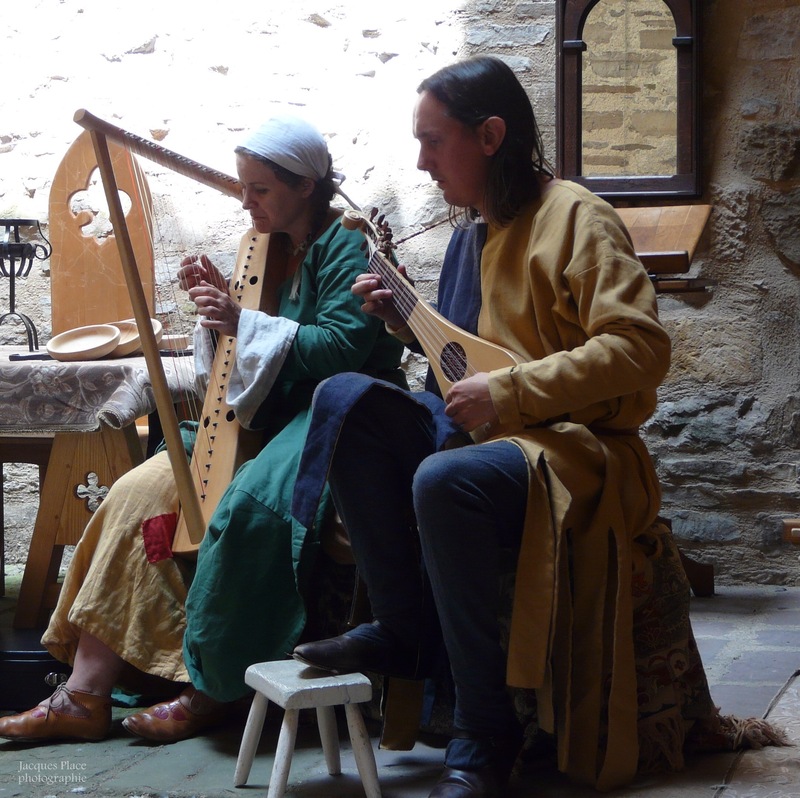 It’s important to realise that for secular music the Anglo-Norman and Angevin aristocracy of England would have been enjoying the repertoire of the troubadours and trouvères, just like their continental cousins but, that said, there is also some music extant in English. We will certainly feature ‘Miri it is’, and are also working on ‘Man mei long him lives wene’ and ‘Foweles in the frith’, although this last may take us too far out of our time frame. So, as you can see, the programme is still somewhat up for grabs, but we think that it is shaping up well and we are very much looking forward to presenting this broad sweep of music from the time of England’s Angevin kings. This really was the age of magnificent melody, whether in the monophonic song or in the excitingly blended lines of polyphony. We aim to bring these melodies to life with a range of contemporary instrumentation and show what a wonderful musical world this was. If you are interested in booking Trouvère for Magna Melodia do get in touch! We’ll be putting up some tasters of Magna Melodia over the next few months. And if you have any comments or suggestions for inclusions in the programme, we’d love to hear them.